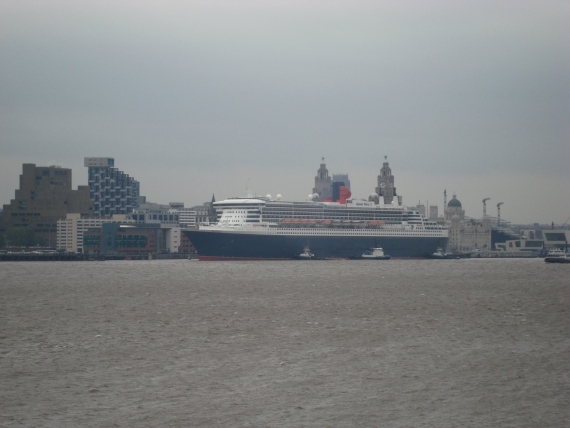 Today the magnificent cruise liner the Queen Mary 2 docked in the River Mersey. I captured a few photos of the huge liner, positioning myself down on Egremont Promenade in Seacombe, Wirral. Despite the windy, cold and grey day there were many onlookers and photographers enjoying the rare view. The QM2 is one the largest cruise liners ever built and I gather when she was constructed in 2004 she was at that time the largest liner in the world. You can read more about this magnificent liner at the official website – note these facts about her too. Great to see such a fantastic vessel in the River Mersey!